Experience the best of traditional Hebridean Hogmanay in the Isle of South Uist, complete with hotel music sessions, village-hall dances and an old-style cèilidh in Grogarry Lodge, a 19th century hunting residence. 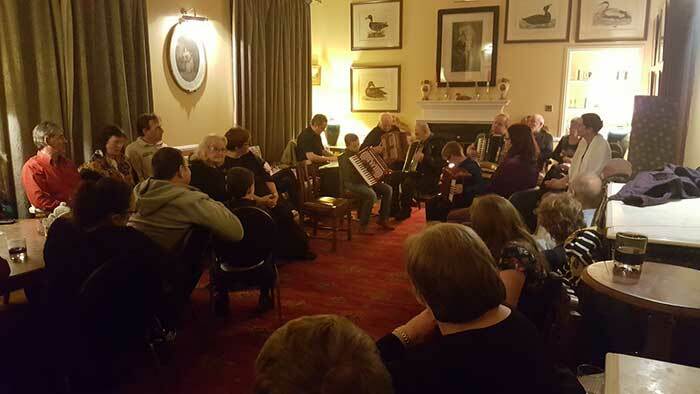 From the unique survival of the Hogmanay boys reciting their centuries-old poem to lively Gaelic piping, the Fèis is the perfect lift during the dark winter months. Fèis Chullaig takes place between Christmas and New Year’s Eve in South Uist, consisting of a series of community-centred events for all ages. All events are entry by donation, except the Dance in Talla Staoinebrig, the Trail West Dance, and the Cèilidh Chullaig. The Cèilidh Chullaig in Grogarry Lodge must be reserved (£20, including bus transport, cocktail and seafood hors d’oeuvres).